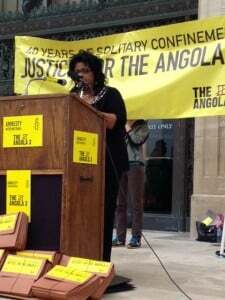 Angela A. Allen-Bell joins Amnesty International in support of the Angola 3 outside of the Louisiana State Capitol on April 17, 2012. Several pages of Bell’s new article examine the case of the Angola 3 in the context of the broader government repression faced by the Black Panthers. Bell is no stranger to the Angola 3 case. Her 2012 article written for theHastings Constitutional Law Quarterly, entitled “Perception Profiling & Prolonged Solitary Confinement Viewed Through the Lens of the Angola 3 Case: When Prison Officials Become Judges, Judges Become Visually Challenged and Justice Becomes Legally Blind,” used the Angola 3 case as a springboard for examining the broader use of solitary confinement in US prisons. We interviewed Bell previously, following the release of her 2012 law journal article. 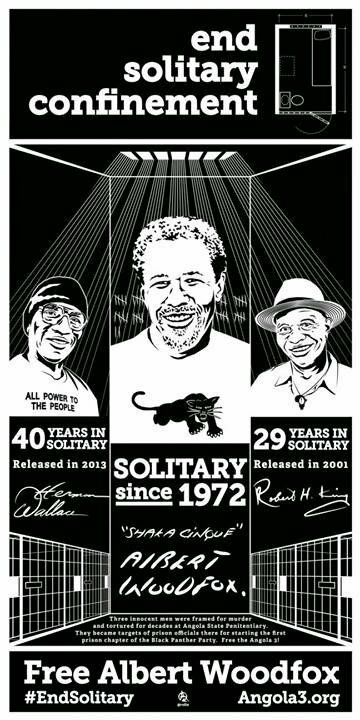 Since the Angola 3 News project began in 2009, we have conducted interviews focusing on many different aspects of the Black Panther Party and the organization’s legacy today, including: Remembering Safiya Bukhari; COINTELPRO and the Omaha Two; The Black Panther Party and Revolutionary Art; Dylcia and Cisco on Panthers and Independistas; “We Called Ourselves the Children of Malcolm”; Medical Self Defense and the Black Panther Party; and The Black Panther Party’s Living Legacy. On a larger scale, the lack of a definition diminishes the word’s use to a watered-down expression that can mean virtually anything. Allegorically speaking, the terrorist is the new nameless enemy, which to some may include all foreigners, immigrants, welfare recipients, or democrats, to name only a few. Terrorist has become the twenty-first century equivalent of communist, a generic term of derision whether the target perpetrates violence or just maintains a different point of view. It has entered the lexicon as a propaganda tool to label competing ideologies and promote fear and bigotry. A3N: In your new article you directly confront the mainstream portrayal of the BPP as being a ‘terrorist’ group. Since you conclude that they were not, in fact, ‘terrorists,’ can you please explain how and why you reached this conclusion? A3N: If, as you argue, the BPP was not, in fact, a ‘terrorist group,’ what do you think it was about the BPP that the government actually did feel threatened by? Why did they choose to undertake the well-documented campaign of repression undertaken by the FBI as part of COINTELPRO? The second part of the definition involves acts dangerous to human life. 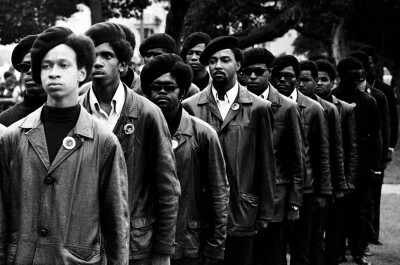 The article documents how every aspect of the government’s covert operations against the BPP was dangerous to human life, including both the lives of the Panthers and the many innocent people who suffered collateral damage. The baseless raids where officers were over armed (such as the raid on the New Orleans Panthers), the pretextual stops used to justify illegal arrests or to incite violence, and the periods of unjust incarceration were all extremely dangerous to human life. Of course, this article is written with all the benefits that accompany hindsight. It is only fair to recognize that the government, at the time of the BPPs activism, was littered with competing forces, interests and pressures and the advent of new demands being placed upon it. Not only were these things taxing, but the situation intensified because there were no breaks in tensions. They came simultaneously and in close proximity so as not to allow time for rational thought to take command and there was no precedent to serve as a blueprint. Add to this gumbo mixture, a government being confronted with the likes of the BPP for the first time in history. When one comes to terms with the complexities of the situation and can appreciate how they were magnified by the setting within which these developments unfolded, one is forced to bear a degree of understanding for how such a tragedy was set in motion. While these things must be taken into account if the discussion is to remain honest and impartial, they must not serve as exit points or escape routes for those seeking a way out of this conversation vis-a-via the path of least resistance. Angola 3 News need your help to spread the word. Please consider joining the networks we are now building at You Tube, Live Journal,Care2, Twitter, Facebook, and My Space. If you have advice about other websites we should consider networking at, or can help in any other way, please write us at [email protected]. Read other articles by Angola 3 News, or visit Angola 3 News’s website.